Alexei cares about his exam grade and his free time. We have seen that his preferences can be represented graphically using indifference curves, and that his willingness to trade off grade points for free time—his marginal rate of substitution—is represented by the slope of the indifference curve. Here we show how to represent his preferences mathematically. Since both grade and free time are goods—Alexei would like to have as much of each as possible—the utility function must have the property that increasing either or would increase . In this case, we say that utility depends positively on and . Alexei’s utility function has two arguments. Just as a function of one variable may be represented graphically by a curve on a plane, a function of two variables may be represented by a surface in three-dimensional space. Since three-dimensional diagrams are awkward to handle, economists analyse utility graphically using the same technique that is used to represent the three-dimensional space we live in: a contour map. Contours are lines joining points of equal height above sea level. Similarly, indifference curves are the contours of the utility surface, joining points of equal utility. where the constant stands for the utility level achieved on the curve. Different values of correspond to different indifference curves: if we increase we obtain a new indifference curve that is above and to the right of the old one. You can see three of Alexei’s indifference curves in Figure 3.6 of the text, which we reproduce as Figure 1 below. Figure 1 Mapping Alexei’s preferences. 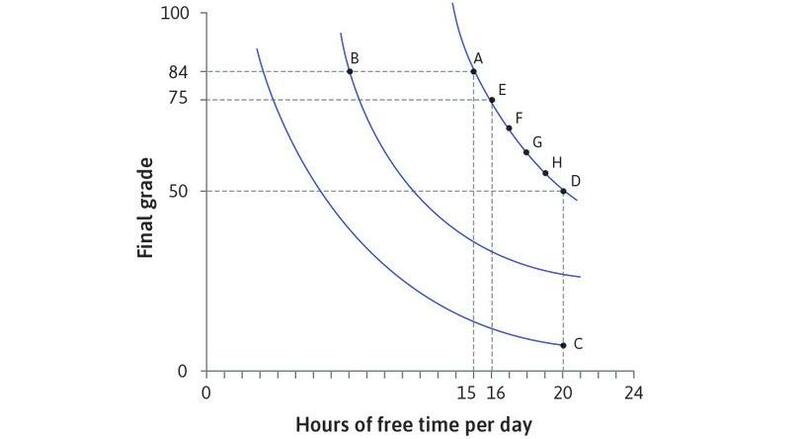 Given any combination of free time and grade, Alexei’s marginal rate of substitution (MRS) (that is, his willingness to trade grade points for an extra hour of free time) is given by the slope of the indifference curve through that point. How can we calculate the slope of the indifference curve ? To do this, we need to use the partial derivatives of the utility function. For example, captures how utility changes as increases, holding constant. In economics the partial derivative is called the marginal utility of free time. Similarly is the marginal utility of grade points. We have already noted that utility depends positively on and . In other words, Alexei’s marginal utilities are both positive. We calculate the slope of the indifference curve using a technique called implicit differentiation, which we shall meet again in later Leibnizes. In the present case, the method involves considering how exam grades would need to change if free time increased by a small amount, in order to keep utility constant. The changes and together produce a small movement along an indifference curve. So if we now take the limit as , the left-hand side approaches the slope of that curve and the approximation becomes an equation. Defining the MRS as a positive number allows us to say, for example, that the MRS is higher (Alexei is more willing to trade off grade points for free time) at points where the indifference curve is steeper, whereas the slope of the indifference curve is more negative at such points. The MRS is the rate at which Alexei is prepared to trade grade points for additional hours of free time. The equation above, expressing the MRS as a ratio of marginal utilities, may be interpreted as follows: the MRS is approximately equal to the extra utility obtained from one more unit of free time, divided by the extra utility obtained from an additional grade point. As usual with interpretations of exact statements involving calculus in terms of individual units, the approximation is a good one if units are small quantities. Alexei’s MRS falls if his free time becomes greater and his exam grade decreases in such a way as to keep his utility constant. This property of Alexei’s preferences is known as diminishing marginal rate of substitution and is usually assumed when we draw indifference curves with two goods. Another way to describe this assumption is to note that Alexei’s indifference curves are convex. In algebraic terms, if we rewrite the equation of an indifference curve in the form , then is a decreasing and convex function of for given . We say that Alexei has convex preferences. A person whose preferences are convex always prefers mixtures of goods to extremes of either good. If we draw a line between two points on the same indifference curve, then each point on the line is a mixture of the two end-points. When the indifference curves are convex, all points on the line between the end-points give higher utility than the end-points. We shall give an example of a utility function displaying diminishing MRS in the next section. Read more: Sections 14.2 (for the small increments formula) and 15.1 (for contours and implicit differentiation) of Malcolm Pemberton and Nicholas Rau. 2015. Mathematics for economists: An introductory textbook, 4th ed. Manchester: Manchester University Press. In this section, we look at a particular utility function that is often used in economic modelling. We derive expressions for the marginal utilities and the marginal rate of substitution, and verify their properties. where and are positive constants. This function has some very convenient mathematical properties. It is called a Cobb-Douglas function after the two people who introduced it into economics. Notice that when and are positive, so is . Hence the assumption that is also positive implies that . Similarly, implies that . In other words, the assumption that both and are positive ensures that ‘goods are good’: Alexei’s utility rises as free time or grade points increase. The indifference curves are downward sloping in space, so as we move to the right along an indifference curve, rises and falls, and thus falls. Since and are positive, MRS also falls. Thus, the Cobb-Douglas utility function implies diminishing MRS.
Read more: Sections 15.1 and 15.2 of Malcolm Pemberton and Nicholas Rau. 2015. Mathematics for economists: An introductory textbook, 4th ed. Manchester: Manchester University Press.